"He pushed the book over into Mr. Shawnessy's lap. The title was stamped in gold on a black clothbound cover, eighteen by fifteen inches. 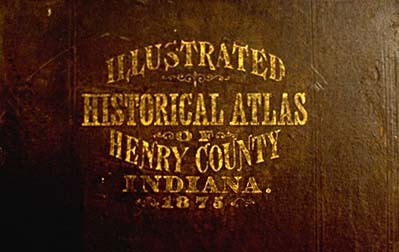 The Atlas was an inch deep, corners and spine reinforced in tooled black leather. 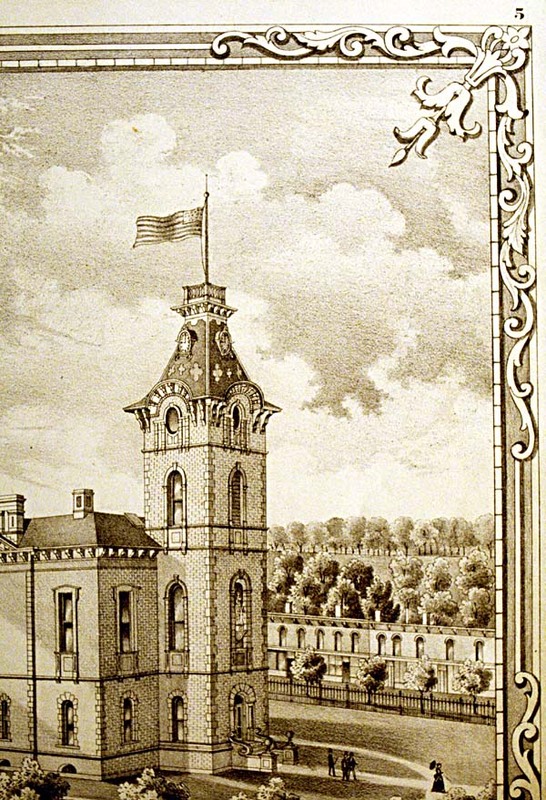 The full page lithograph of the Court House showed a rectangular brick and stone building. A tall tower set into the west end contained the Main Entrance, an American flag stood stiff out from the peak of the tower, and two clock faces visible in the sloped roof read nine o'clock. Two ladies, bustled, bearing parasols, walked on symmetrical paths of the court house lawn. Over the Main Entrance a draperied woman stood in a niche, blindfolded, leaning on a sheathèd sword, holding bronze scales." "Into the faintly golden texture of the great soft sheets, an unknown artist had touched the earth of Raintree County with a sensitive pencil. In the sketches of farm homes, the principal building was seen as from a slight elevation so as to include a generous setting of outbuildings and the land around. Walks, lanes, roads, forests gardens, pastures, cornfields appeared in accurate perspective. 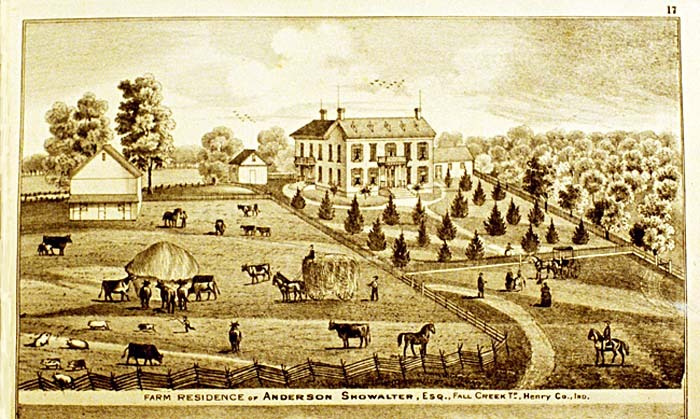 People played croquet on lawns; children skipped ropes, rolled hoops, pulled wagons; families passed in surreys, spring wagons, buggies; mare and colt scampered in the pasture; the great bull passively grazed behind the barn; the farmer engaged in his characteristic occupations--feeding, mowing, raking, plowing. The earth had the effect of being a massy substance continuous under all traces of humanity. Through page after page, this earth of Raintree County appeared in an unvaried summer morning, radiant and precise to a depth of miles, until sky touched horizon with a frieze of soft clouds."